What will make me get up at 6am on a Saturday morning? The Wilton Tent Sale of course! 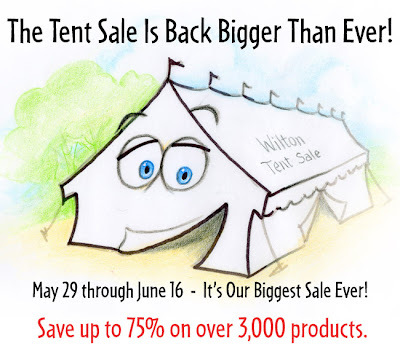 The Wilton Tent Sale is an annual event that takes place just outside of Chicago at their headquarters in Woodridge, IL. Today was the first weekend the sale was open since 2007 (they didn't have a sale last year) and it's also dubbed the Baker's Black Saturday among those who are familiar with Wilton products. I arrived at 7:30am, 30 minutes before the sale started, and there was already a long long line of anxious shoppers before me. It was an amazing sight to see how many people came out for this sale! Clearly hundreds of people were in line before the opening and it was only the first Saturday. While in line, I met folks who travelled from Minnesota, Iowa, Indiana, Wisconsin and Michigan, as well as all over the state of Illinois! Again, I am SO jealous of all of you ladies who are able to go! I am glad you found so much great stuff. I wish I lived closer to Chicago!! You got tons of great stuff!! No FAIR! Looks like you had a great time! Do some of those cupcake boxes hold 12 cupcakes?? I've never seen those in the stores before. Glad you had a wonderful time. It looks like you did really well! I wish I could go. Can you post the prices too? I'm just curious. Thanks! This all looks so incredible Joelen... I'm insanely jealous! I would love to go in for just a few minutes to snag some deals. Just the sprinkles and cupcake liners alone would be enough to make me happy... but look at all the other goodies you can find! I am sooooo very jealous. You got tons of awesome stuff. OH...EM...GEEZ!!! I am drooling right now! So lucky! Always wish I was just a WEE bit closer to Chicago so that I could go to this sale (OK -- I could go, but I'd have to get up at the crack of dawn to get there). Looks like you made a killing! Wow Joelen - you really did a number on that sale - good job! What an awesome loot you have there! I think the Hubs and I are definitely taking a trip to Chicago next year, JUST for this! Wow, you've hit the motherload! That's some awesome loot you scored there! positioning this put up upper! Come on over and seek advice from my site .